We’re not so sure of that. Motorcyclists are an inherently conservative bunch—especially older folks with the cash to splash on a new toy. 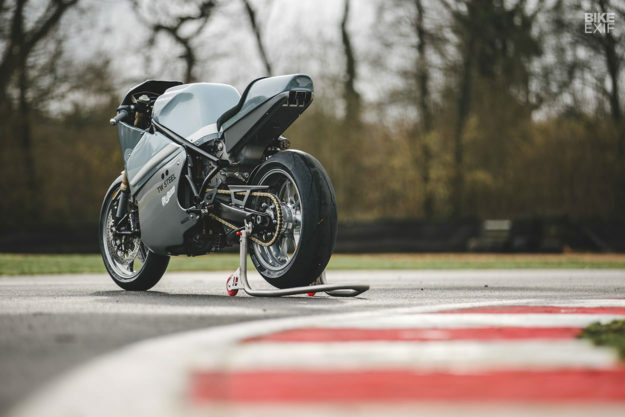 We’d be happy if future electric motorcycles followed the lead of this amazing Energica, remodeled by England’s deBolex Engineering. The project was kickstarted by Gareth Maxwell Roberts, the director of the documentary film Oil in the Blood. The film champions analog values and traditional skills, but also has an eye on the future. So when Gareth commissioned a build to celebrate the film’s release, he decided to merge these two ideals. 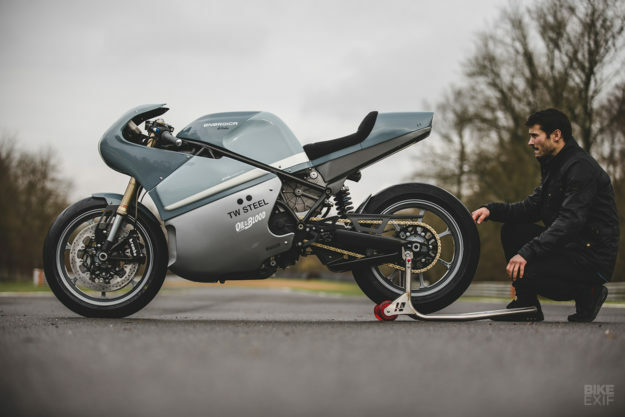 Choosing Calum Pryce-Tidd and Des Francis of deBolex was a no-brainer: they’re traditional craftsmen, among the best in Europe, and have built bikes for Gareth in the past. 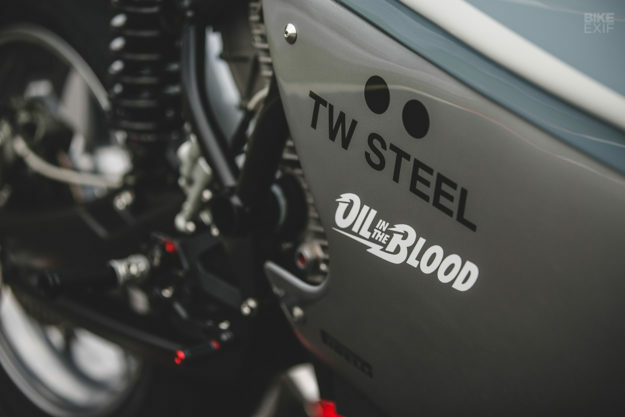 Gareth needed a partner on the build, so he reached out to TW Steel. The Dutch watchmaker has already commissioned customs for its Sons of Time program, and loved the idea of an electric special. 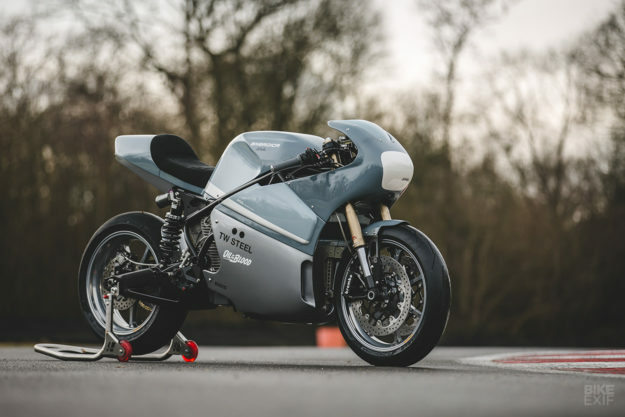 After extensive research, Gareth and Calum found their base bike: the Eva, from the Energica Motor Company of Modena, Italy. 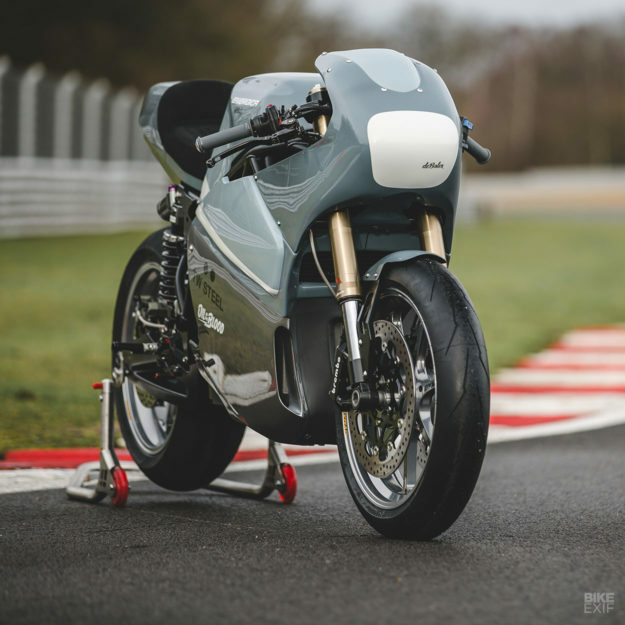 Energica are deeply rooted in racing, and will be supplying the machines for the upcoming MotoE class in MotoGP this season. 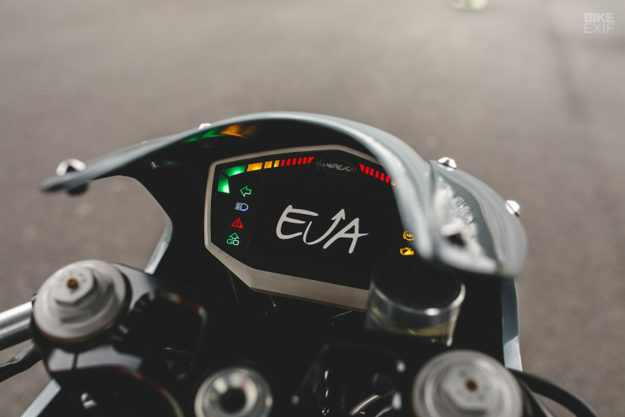 The Eva is a full-bore streetfighter with the equivalent of 145 hp and 200 Nm, and a decent range of 125 miles. 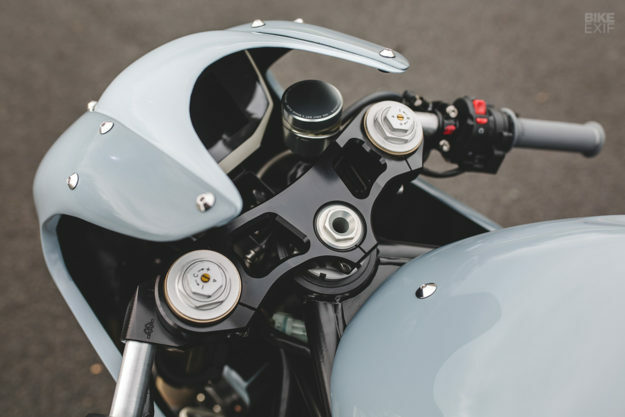 It’s insanely fast and handles well, making it the sort of bike deBolex could restyle without having to worry about improving the basics first. Paul d’Orléans of The Vintagent introduced the team to Energica’s CEO Stefano Benatti, who immediately saw potential. 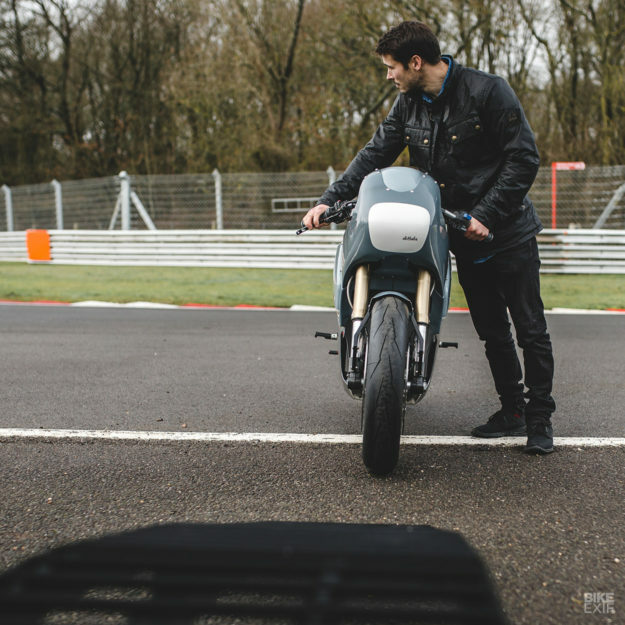 So Calum and Gareth visited the factory for a briefing by Energica’s chief technology officer Giampiero Testoni. The Eva turned out to be a pleasant surprise. deBolex just needed to relocate the ABS module and water pump, and adjust the rear subframe. With that out the way, they had a clean rolling chassis ready to accept bodywork. Calum and Des spent the next few days sketching out their ideas, before settling on a final design. They started hand shaping up the new bodywork from aluminum, using traditional coach-building techniques. 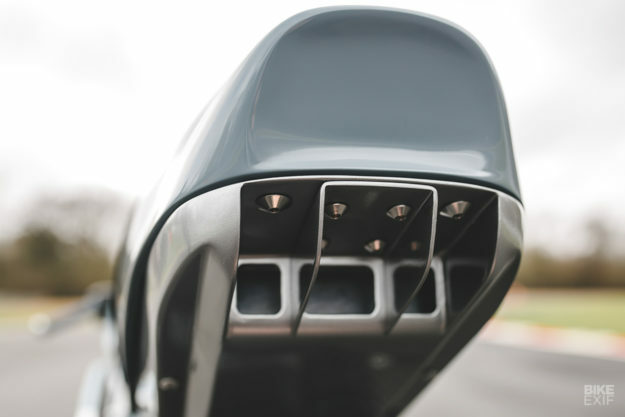 The Eva’s new body panels are designed to flow from front to back, visually slimming down the bike and giving it a more classic race vibe. 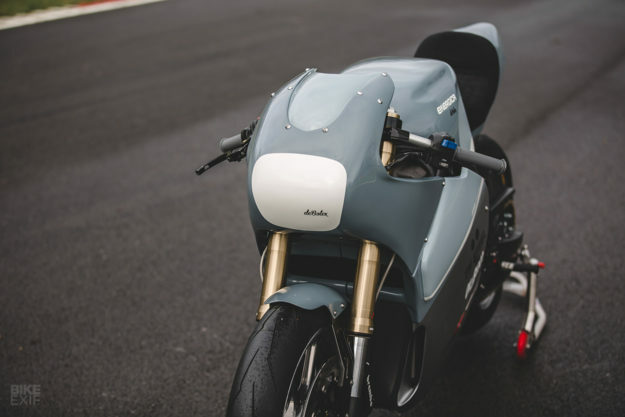 The biggest design challenge with electric bikes is usually their bulky, square batteries—so Calum and Des worked to cover up the power cells, and expose more of the interesting motor instead. 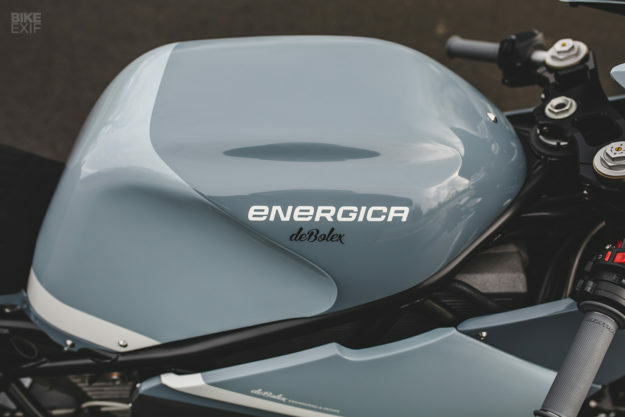 DeBolex did a stellar job of incorporating the Energica’s cooling system into the design, with lines that lead away from the water cooler, and follow through to the knee indents on the tank. And they made sure that there were enough vents to channel air where it needs to go. 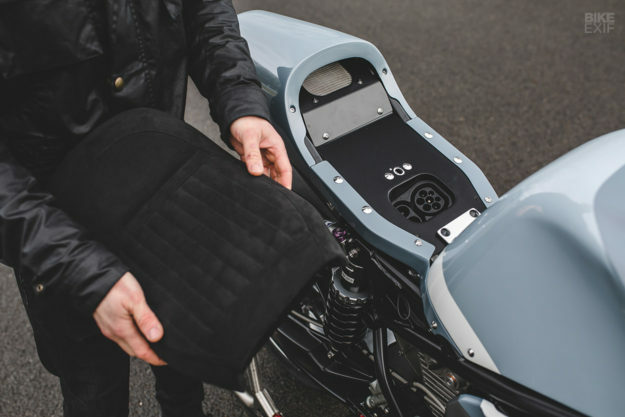 The power controller sits behind the new ‘tank’ cover, and the onboard charging unit under the tail. That part was a challenge, as it meant building a larger rear hump than the lads usually like to do. Still, they knocked it out the park. Des covered the new seat in Alcantara; as with all deBolex builds, it pops off easily to make maintenance a breeze. DeBolex aren’t known for half-assing a project—so this racer’s packing a healthy upgrade list too. 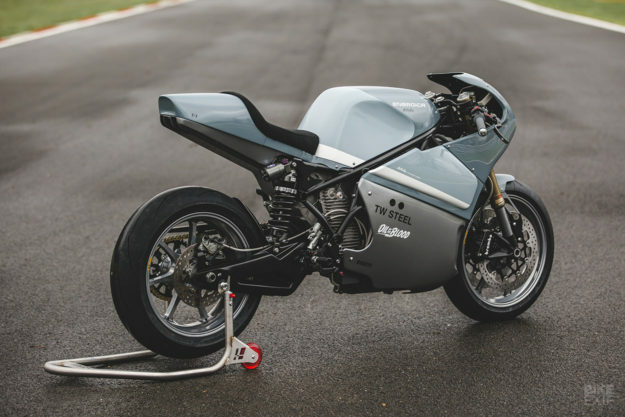 There’s a Maxton RT10 shock out back, and a set of forged aluminum Dymag UP7X wheels, wrapped in Pirelli Diablo Supercorsa road-and-track tires. The brakes have been upgraded too, with Brembo calipers and discs, plus a Magura master cylinder. The rear sets, brake reservoir and bar ends are from Rizoma, and the grips are from Renthal. DeBolex also used Pro-Bolt fasteners throughout the build. 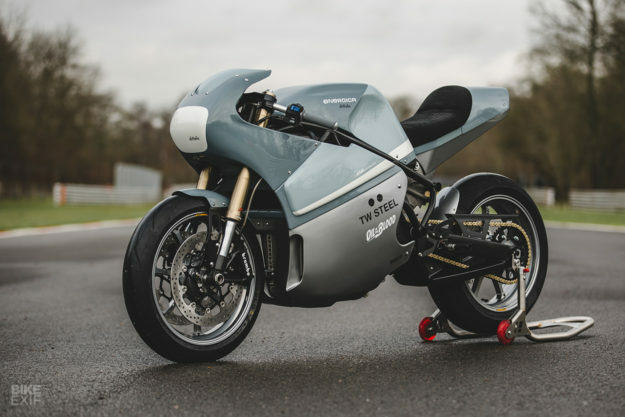 The Energica Eva was finally buttoned up at 6 am, on the morning of the Oil in the Blood premiere in London, and revealed in the evening alongside a limited edition TW Steel timepiece. Sounds like a match made in heaven. We’ll let Calum and Des get some sleep while we spend the next few days fawning over their incredible work.